These reports have been made to Aberdeenshire Council in the area covered by Turriff and District Community Council using the Fix My Street service. 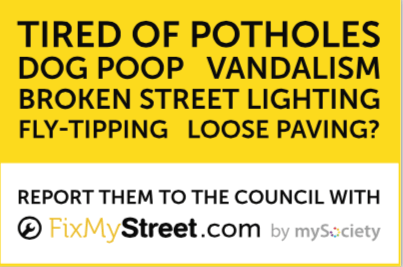 You can send your own reports via https://www.fixmystreet.com or you can download apps for Apple & Android devices so you can send reports on the move. You can add your own comment to the existing reports by clicking on the link in each report. These potholes have been here for several months but are becoming larger and dangerous. The largest 3ft is hidden when it rains so can be very nasty when you hit it. Potholes at entrance and inside entrance to Turriff Caravan Park on the road frequently used by Aberdeenshire Council to access their building at the rear of the Caravan Site. This problem appears to have increased during the caravan park closed season when only Aberdeenshire Council vehicles have been using the roadway. 2 x Disabled Bays in Gordon Road, Turriff require remarking as very faint allowing non disability vehicles to park to the detrement of those who are disabled and require disabled vehicle and carer access.